installed in Stockbridge. We will also be featuring stellar new works as well as a "Masai" by Lino Tagliapietra. Staff Pick of the Month: Bocita Paila by Charles Miner. Washington, where he studied under David Reekie and Clifford Rainey. To create the unique, stone-like texture of his pieces, Miner users a laborious process called Pate de Vere (or fuse casting). After a series of steps involving a carving wax, porcelain or clay original and a rubber mold, 24% lead crystal glass is heated in an electric kiln, which oftern reaches temperatures of 1600 degrees. It is then slowly cooled over the next week or two to prevent cracking and polished with sanding blocks impregnated with diamond chips. The entire process can take upwards of three months to construct a single piece. Miner comments: "These pieces represent my goal to have a body of work that is visually pleasing on both the interior and the exterior, but that still hold a certain utilitarian feeling." of Fine Arts in Sante Fe, New Mexico; and the Tucson Museum of Art in Tucson, Arizona. Holsten Galleries will be premiering works from Miner’s newest series at SOFA New York 2006, May 31-June 4. This summer, we will be showing the best new works by our artists. See our website for recent arrivals! November 10-12 SOFA CHICAGO Navy Pier Chicago IL. 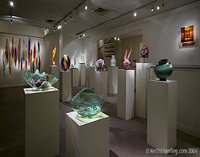 Including works by Marvin Lipofsky, Lino Tagliapietra, Dante Marioni, Preston Singletary, and Dale Chihuly. On display until October 15, 2006 at the Seattle Art Museum in Seattle, Washington. Participating artists include Sonja Blomdahl, Dorothy Hafner, Sidney Hutter, Kreg Kallenberger, Marvin Lipofsky, Dante Marioni, Charles Miner, Stephen POwell, Chris Ries, David Schwartz, Lisabeth Sterling, and Steven Weinberg. Country Satellite in Escondido, California. Botanical Garden in St. louis, Missouri. "Chihuly at the New York Botanical Garden, Bronx, NY"
showing November 10, 2006 – November 2009. The Columbus Museum in Columbus, Georgia; April 8 – July 9. The Huntsville Museum in Huntsville, Alabama; July 3 – October 29. "Retrospective" at the Foundry Art Centre in St. Charles, Montana.